A firearm has been recovered during a search of the area where a man was shot in the chest and died. Police said they have had a good response to their appeal for witnesses to the incident in Bristol. The victim, who has not been named, was attacked inside Club UK in the Stokes Croft area early on Saturday. Det Supt Arthur Lewis said: "We don't know why this man's been shot. We know some people know and we want them to come forward." Police do not know whether the firearm that has been found was the murder weapon or how many shots were fired. They are carrying out a forensic examination. They are also studying CCTV footage of the area and some 40 officers, who are working on the case, are following a number of leads. Mr Lewis said: "The club was still open at the time [of the shooting] and there were a lot of people in it. "Quite naturally people inside and outside the club would have been alarmed by what happened but we would still like to hear from them." 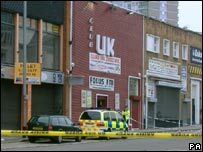 Police believe the incident happened at about 0400 BST after a disturbance in the entrance area of Club UK. The victim, believed to be in his late teens or early 20s, was taken to Bristol's Royal Infirmary but died shortly later. Prayers were said on Sunday afternoon outside the club to remember the victim and offer support to his family.